Thought this would be a good opportunity to have a look at the business perspective of using Ruby on Rails for the enterprise. The Business Case for Ruby on Rails inspired me to see what has been written on the business perspective since this was written December last year. Very high fidelity prototypes that can use real data. The high fidelity give much better findings in usability testing. Consistent productivity gains compared to any other prototyping tool. Very few lines of code makes it easy to change prototype. Doesn’t have to be thrown away after building prototype. Thursday marked a major step on the path to exploring Rails as an alternative for BiQ. As I’ve mentioned earlier I’ve been looking for someone to come and present Rails for us. I could spend a lot more time talking about the details of Ruby and Ruby on Rails but the important point to take away is that it puts extreme power in the hands of the average Web developer by collapsing the common tasks from literally days to just hours or even minutes in some cases. I’ve seen some of the demonstrations in person (most recently Hansson’s talk at Real-World Ajax) and am continually impressed by how fast and easily that working software can be created with Rails. Creating blog or wiki software from scratch can literally take just a few minutes. Something else that’s interesting is that issues like this [distributed transactions] are not stopping adoption of Rails. Companies like 37signals are forging ahead creating great solutions, deployed and live. Obviously Rails is “good enough” – its lack of many enterprise features, distributed transactions being another important one, doesn’t prevent adoption. Perhaps 37signals do something funky with their database connection handling, or perhaps it just doesn’t matter for the vast majority of applications out there. I suspect that the latter is closer to the truth. In J2EE land we tend to focus on solving the difficult problems, instead of making the easy problems easier to code. This is one of the biggest lessons that J2EE can learn from Rails – productivity. It also helps that Ruby on Rails can crank out a system in about 1/3rd of the time as PHP, but that’s probably my own coding preferences talking. Want a realistic example of what I’m describing? Two well-respected consultancies find themselves competing head-to-head for a project: a fairly typical internal web application, of the type that large corporate clients often request. Both consultancies follow Agile practices. Timely delivery for this project is critical (as usual), but delivering on-time is particularly important in this case. The client will get hit with severe regulatory penalties if the new system is not implemented within a year’s time. The decision makers at Consultancy A propose a Java-based solution at a price of a million dollars, and they estimate final delivery within 10 months. Their bid is competitively-priced and they feel confident about it. They plan to allocate an experienced team using a mature platform (Java). They calculate, using rough figures, that 6 resources x $97 blended hourly rate x 10 months equals about $1MM, a gross margin of about 25%. A higher margin would be better, but all-in-all this deal is not too shabby. The folks at Consultancy B also have extensive experience building the kind of webapp needed and they see a potential productivity arbitrage play. Instead of Java, they differentiate themselves by pitching a Ruby on Rails solution. Quite innocently, they undercut their competition by pricing their bid at $800K and promising delivery within 6 months. According to their calculations, (and once again, these are rough figures), 4 resources x $192 rate x 8 months equals about $800k. That rate ($192) represents a much higher gross margin, even taking into account that Consultancy B pays its consultants higher salaries. Consider the fact that Rails can actually live on in the application development. I believe that Rails is a perfect match for making rapid prototype development. Also this approach is what Garret Dimon invented “just build it“, and it fits like a glove with the agile approach of the guys at 37signals. Real world sucess stories: List of web applications running Ruby on Rails, and another list of Ruby apps (web applications at the bottom). Do you know of any relevant articles out there? Please add to my list. I’m mostly looking for the not-so-technical and management targeted. 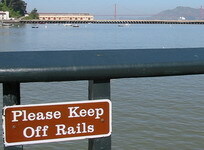 Sure hope that not everybody will follow the advice of San Fransisco Authorities to keep off Ruby on Rails. This entry was posted by Jesper Rønn-Jensen	on Tuesday, May 16th, 2006 at 00:06 (GMT-1)	and is filed under Businesscase, Ruby on Rails. You can follow any responses to this entry through the RSS 2.0 feed. Both comments and pings are currently closed. Great information :). Very high fidelity prototypes that can use real data are essential to this type of project.